Growing up in Oregon, an area known for it's logging (deforestation), I heard all the stories about Paul Bunyan and Babe the blue ox and all that kind of jazz. So when I think of buckwheat, I automatically think of buckwheat pancakes. Now, because I have obtained a slightly wider culinary perspective over the years since my childhood, this is usually followed by thoughts of Soba Noodles, Pizzoccheri and Buckwheat crepes from Brittany, which brings me back to pancakes again. While named "Buckwheat", which comes from the Dutch word boek or beech, due to the triangular shape of the "seeds" thus being "Beech Wheat", it is not related to wheat at all, nor is it even a cereal grain. Buckwheat looks like this. Not very "Wheat-esque" is it? What it IS though is high in Amylopectin, like Arborio rice, and it contains a full set of biologically available essential amino acids, which puts it on par with soy products without all the processing. It's rich in Iron, Zinc and Selenium as well as the antioxidant Rutin. Basically, it's really good for ya. So in order to get a little more healthy grains in my diet, I have modified a potato gnocchi recipe to include at least a little Buckwheat flour. Due to it's lack of gluten, however, I was forced to still include some regular AP flour to hold the gnocchi together. The Buckwheat gave the gnocchi a deep, rich, almost sweet flavor that was quite delicious and very reminiscent of Pizzoccheri. This would be really good with a melting cheese such as Fontina or the ever elusive Bitto or even a browned butter, sage and leek tossing. I kept the tossings simple this time, because I wanted to make a judgment call on the amount of Buckwheat flour in the gnocchi. Bake, then Rice your potatoes. Add the egg, buckwheat flour, salt and 3/4 cup of the AP flour, then mix with a fork. Remember, it's OK if you don't use all the AP flour, the less flour the lighter the gnocchi. Lightly flour your board and divide the dough into 4 pieces. Roll your 3/4 inch diameter "snakes", then cut into 1/2-3/4 inch pieces; pass each peace down a gnocchi board, across fork tines or do the "press & flick". Place in a warm bowl. Melt butter in a sauté pan. Add mushrooms and sauté until the release their liquid. Add marjoram at this point and cook 1 minute more. Pour over gnocchi, add chopped Parsley and toss. Once more great looking gnocchi. 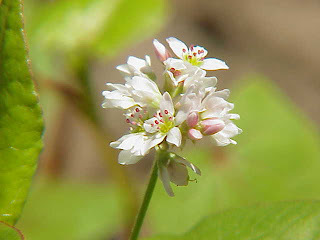 And I also find very useful all the information about buckwheat, will have to pay more attention to what I eat. I don't think I've ever had buckwheat, but it sounds delightful. I'll have to get my hands on some. The gnocchi looks great! How interesting....I like the idea of the deep, rich flavor. I'm not very fond of the blandness that I find gnocchi to have which is why I prefer to fry them..and it makes them not so "doughy" or pasty (?). Although that could be because I'm not making them right? I dunno.I'm still very new with the whole gnocchi thing. I only heard of them for the first time since spending time in the forums on BakeSpace. I have still not tried gnocchi. That looks so good!